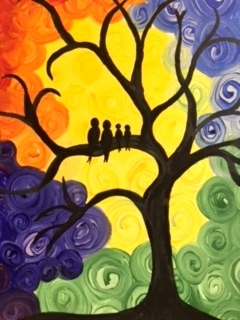 We offer Home Parties, Fundraisers, Corporate Team Building and Classes at your location or at our Gallery. We bring the art supplies and provide instruction. Select from a variety of projects for your Shower, ﻿Birthday Party, Bachelorette Party, Girls Night Out or just a fun evening with friends. How to book a party: Review our offerings, find the one you like then contact us by filling out the form at the bottom of this page. 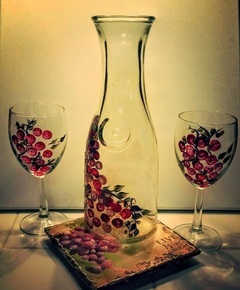 Acrylic Wineglass painting. 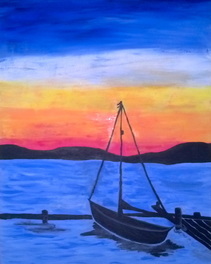 Instructor will guide you through a step by step process with acrylic paints. You'll start with the background, followed by the wineglass, and ending with detailing to make your picture pop right off the canvas! All supplies provided and no experience necessary. 16 x 20 $25 per person. Love is in the Air! 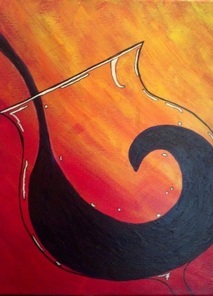 Our artists will guide you through the process to make this painting! Great for a Bridal Party! Afternoon in Venice Instructor will guide you through this acrylic painting. 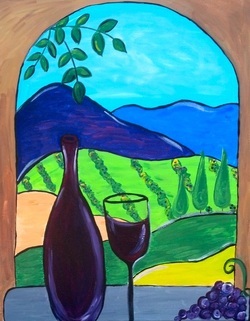 Great painting for the wine lovers! Bold Family Tree. With the help of our artists create a bold background with a silhouette of a tree holding a family of birds on a branch. Could this be a family portrait? Sure! Country Flowers. 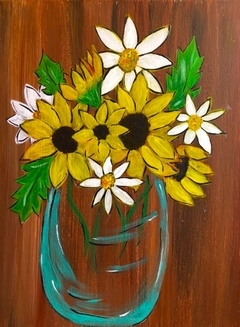 Our artists will lead you in a step by step process to make flowers in a clear vase/mason jar. All supplies are provided and no experience necessary. 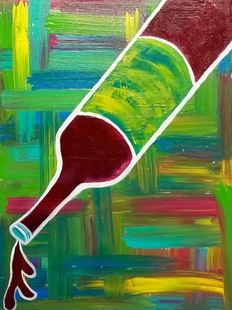 Acrylic Abstract Wine Bottle Painting. Instructor will guide you through a step by step process starting with the background first, followed by the wine bottle. All supplies provided and no experience necessary. Great start for a Bachelorette Party! Set of 2 20oz Wineglasses. 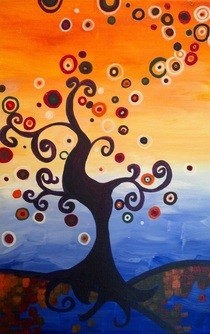 The instructor will guide you through painting with enamel paints on a pair of 20oz wineglasses. We offer a variety of designs. Fall popular designs are grapes or pumpkins. ﻿Let us know which is your favorite and everyone in your group will use the same design, each person person's will look unique. One design per class. Shimmering Christmas Tree. Instructor will guide you through a step by step process starting with the background first, followed by the tree and lights. All supplies provided and no experience necessary. 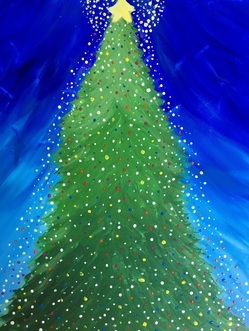 Great way to kick off the Holiday season with a Paint Party! Too Much Egg Nog? 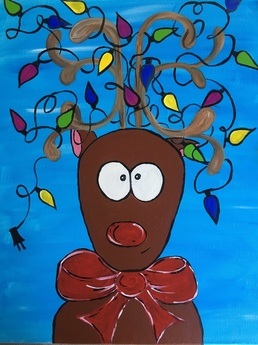 Instructor will guide you through a step by step process starting with the background first, followed by the Rudolph and lights. All supplies provided and no experience necessary. Great way to destress during the Holiday Season! Do You See What I see? 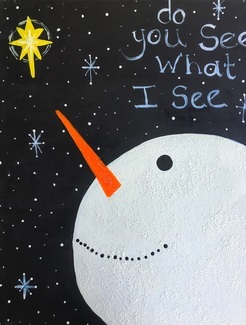 Instructor will guide you through a step by step process starting with the background first, followed by the snowman and stars. Snowman shimmers with snow glitter for an eye-catching detail. All supplies provided and no experience necessary. Fun Painting during the Holidays! Colorful Fish. Instructor will guide you through a step by step process starting with the background first, followed by the colorful fish and then bubbles. Front Seats to Sunset. Instructor will guide you through a step by step process starting with the background and working toward the foreground. 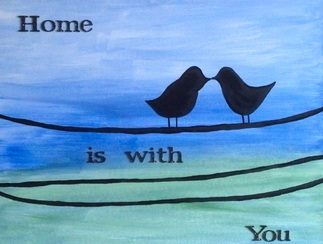 Home is with You. The instructor will guide you through this acrylic painting process. 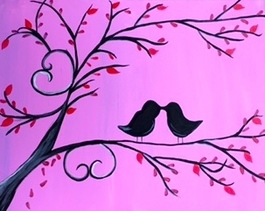 This makes a great painting for any occasion, especially Bridal Showers. Acrylic Owl Painting. Stella's Arts will provide you with all the supplies to create your very own owl! While being guided through this step by step process, you may use our stencil to outline your owl, follow our pattern, or create your own design. 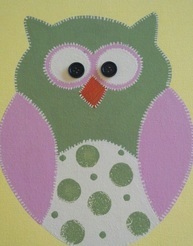 We will teach how to make your owl looked "sewed" onto the 12 X12 canvas. You may choose warm colors or cool colors for your party. 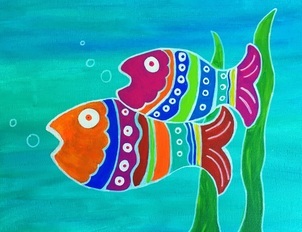 Great painting for any occasion, especially a Baby Shower or Nature Event. Abstract Autumn Tree. The instructor will guide you through this acrylic painting process. What a great way to celebrate Fall. Display this piece September through November in your home! Sailboat Sunset. The instructor will guide you through this acrylic painting process. 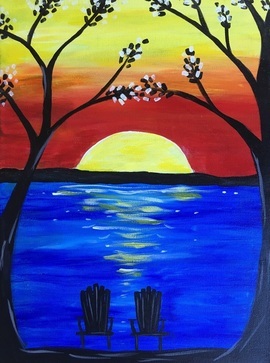 This is a great painting to keep a piece of summer with you. 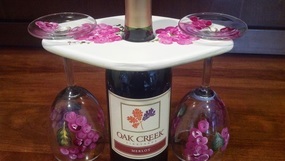 Cork Wreath. 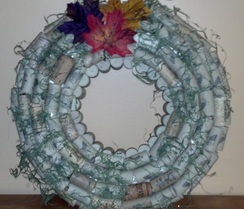 All supplies provided but you may bring your own cork collection to add to your wreath. Your own corks create a story and provide a personal touch to your piece. Think about it, we usually keep the corks that represent a great time, place, or event that we attended. What a wonderful way to honor that memory! Ceramic Scooped Bowl. 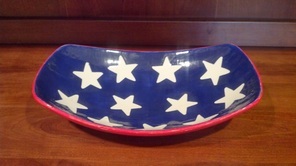 Glaze a 14" L by 9"W by 3 1/4" H serving bowl using a color theme of your choice. Instructor will provide you with examples for you to choose or you can use your own creative juices! We will provide the bowl and glazes. Bowls will be fired after class and a pick up date will be setup with hostess. 3-D Letter Project. 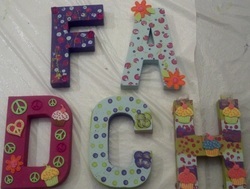 Young Girls Birthday Party - Instructor will guide you and your guests step by step through painting the first letter of of everyone's first name. date will be setup with hostess. Must have 5 guests! Deposit is required. Please let us know what date/time and project you are interested in! Please provide the date and time you would like to hold your event. Please select how many guests you expect to attend this event not counting the host/hostess. We will prepare supplies for the number you select plus one.